Christel House is a non-profit school with a single mission: to break the cycle of poverty. Poverty touches every aspect of a child’s life, determines their future and almost always leaves them trapped in a spiral of unemployment and continued poverty. 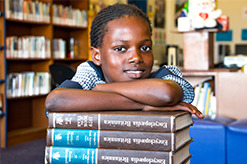 Christel House offers no-fee scholarships to students from some of the poorest neighbourhoods. These students are supported for 18 years with a fully serviced, holistic education that instils the development of character into everything they do. Christel House operates eight schools around the world with locations including India, Mexico and America with a new centre to be opened in Jamaica in 2019. 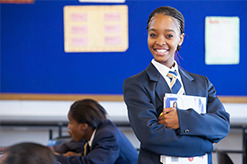 The centre in Cape Town, which caters for Grade R - Grade 12, was established in 2002 and is the only centre in Africa. Through this structured approach they have achieved a spectacular 100% matric pass rate for the last nine consecutive years (since their first Grade 12 class graduated in 2009). Nontando’s one-room shack in Cape Town’s Langa township was so tiny that her father and brother had to sleep outside. “I started at Christel House when I was in Grade 3. I was a below average student, could not speak English and was very shy. In 2009, I graduated as the first ever valedictorian of our school. Christel House changed my life”. Today, Nontando is a successful chemical engineer at Chevron Oil, married and has started her own family. Christel De Haan, who is RCI®'s founder, started the first Christel House in 1998, in Mexico. RCI® proudly supports Christel House. As a valued member/friend of RCI® we ask that you help us in our mission to raise funds for Christel House. Every contribution is welcome and appreciated. 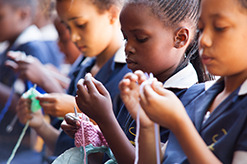 For more information on this worthy cause, please go to www.sa.christelhouse.org or call 0027 21 704 9400.